The Democratic Party made a concerted effort to court religious voters in the 2008 presidential election that pitted Democrat Barack Obama against Republican John McCain.1 Led by Obama himself and aided by progressive religious activists, the Democrats reached out to numerous religious groups in hopes of narrowing the “God gap,” a media catchphrase for a striking pattern in American politics: the more often Americans go to church or other worship services, the more likely they are to vote Republican. An analysis of newly released exit poll data by the Pew Research Center’s Forum on Religion & Public Life finds that Obama succeeded in attracting a larger share of the vote from some religious groups than the 2004 Democratic nominee, John Kerry, had received. Among white evangelical Protestants, for example, Obama picked up 5 percentage points more support than Kerry (26% vs. 21%). And Obama’s gains were particularly large among white evangelical Protestants under the age of 40. He received 33% of their votes, compared with 12% for Kerry four years earlier. In general, however, the contours of religion and politics were the same in 2008 as in 2004. Religion remained a very strong predictor of voters’ choices, and the large gaps in the electorate that had developed along religious lines in earlier elections persisted in 2008. Some of Obama’s largest gains, in fact, were among religious groups that already leaned Democratic, such as black Protestants and religiously unaffiliated voters (those who answer “none” when asked about their religious affiliation in exit polls). Among the most religiously observant Americans – those who say they attend worship services more than once a week (12% of the total electorate in 2008) – Obama received 43% of the vote, up from 35% for Kerry. But all of Obama’s 8-point improvement among these very frequent churchgoers came from minorities, who voted Democratic in 2008 by even larger margins than in 2004. One group that moved strongly in the Democratic direction after having voted Republican in 2004 was Hispanic, Asian and other minority Protestants, not including blacks. These voters (about 3% of the total electorate) had backed Bush over Kerry by 58% to 39% in 2004. In 2008, 56% voted for Obama. But there was little change among other traditionally Republican and swing-voting religious groups, especially white voters who say they attend religious services at least once a week. 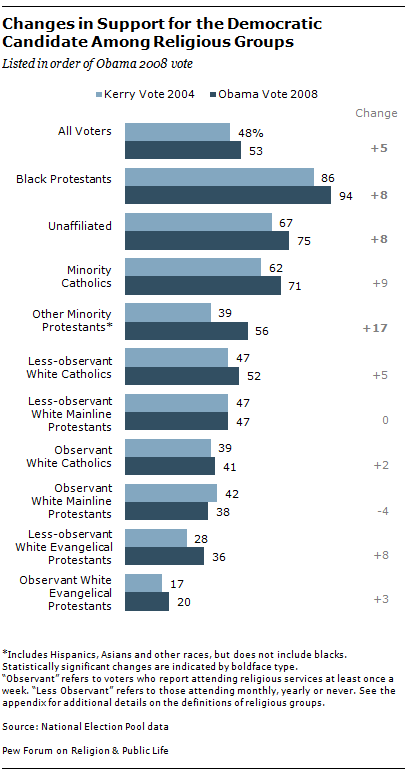 Obama received the votes of 41% of observant white Catholics (compared with 39% for Kerry), 38% of observant white mainline Protestants (compared with 42% for Kerry) and 20% of observant white evangelical Protestants (compared with 17% for Kerry). Among all white Christian voters who say they go to church at least once a week, Obama received about the same level of support that Kerry did in 2004 (29% for Obama, 28% for Kerry). 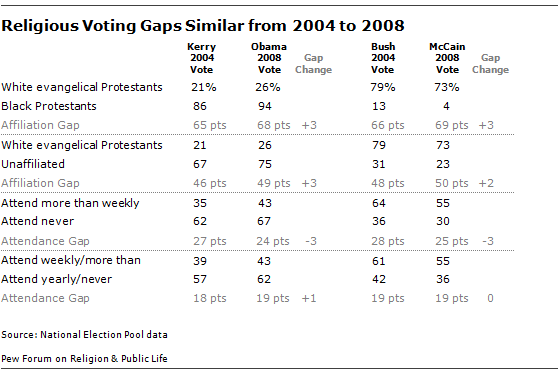 The religious composition of the electorate also remained remarkably stable from 2004 to 2008. 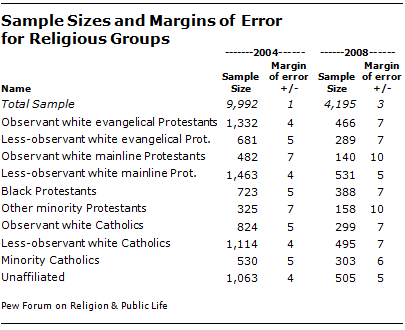 The overall stability in the relative sizes of the major religious groups is another way in which the contours of religion and politics remained much the same in 2008 as in 2004. These conclusions result from an analysis by the Pew Forum of 2008 exit polls conducted by the National Election Pool, a consortium of news organizations consisting of ABC, CBS, CNN, Fox News, NBC News and The Associated Press. The exit poll data were released to the public in May 2010 through the Roper Public Opinion Archives. The newly released data allow a much deeper examination of voting patterns than was previously possible, including breaking the electorate into smaller religious groups and simultaneously taking into account frequency of church attendance, racial or ethnic identity, age, income and other factors. This analysis is based on respondents who were asked religion questions and compares the results with voters who were asked the same questions by the 2004 National Election Pool. In terms of affiliation, black Protestants, minority Catholics and the religiously unaffiliated all have voted heavily Democratic in recent elections. Democrats have received less support from white Catholics and white mainline Protestants, and white evangelical Protestants have voted heavily Republican. One way to see the impact of affiliation is to look at the difference in support for a presidential candidate from religious groups at opposite ends of the political spectrum, such as black Protestants and white evangelical Protestants. For example, Obama won 94% of black Protestants’ votes and 26% of white evangelicals’ votes, a difference of 68 points. 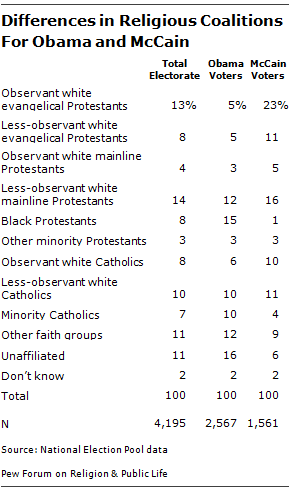 In 2004, Kerry won the support of 86% of black Protestants and 21% of white evangelicals – a 65-point difference. Thus, in 2008, this “affiliation gap” remained about the same as it was in 2004. Similarly, the gap in support for the Republican presidential candidate between religiously unaffiliated voters and white evangelical voters remained virtually the same in 2008 as in 2004 (79% of white evangelicals and 31% of the unaffiliated cast their ballots for George W. Bush in 2004, a 48-point gap, while 73% of white evangelicals and 23% of the unaffiliated voted for McCain in 2008, a 50-point gap). Frequency of worship attendance at a church, synagogue, mosque or other house of worship is also a strong predictor of voting preferences. Both Obama and Kerry did better among those who say they attend religious services a few times a year or never than among the religiously observant (those who say they attend at least once a week). This “attendance gap” remained about the same in 2008 as in 2004. For example, the gap in support for the Republican candidate between the most religious voters – those who say they attend religious services more than once a week – and those who say they never attend was 25 percentage points in 2008, compared with 28 points in 2004. Measured another way, however, there was no change in the attendance gap. In 2004, 61% of those who attended religious services weekly or more voted for Bush, compared with 42% of those who attended yearly or never (a 19-point gap); in 2008, 55% of weekly attenders voted for McCain, compared with 36% who attend services yearly or never (again, a 19-point gap). In the table above, the affiliation and attendance gaps are measured in eight key ways. In none of them did the gap increase or decrease by more than 3 percentage points from 2004 to 2008. Obama made an average gain of 5 percentage points across the U.S. electorate, winning 53% of the national vote, compared with 48% for Kerry. Among young people he did even better, gaining 12 percentage points among voters under age 30 (66% for Obama, 54% for Kerry). Obama also did particularly well among voters with the highest incomes, gaining 17 points among voters who earn $200,000 or more per year (52% for Obama, 35% for Kerry). While Obama gained just 2 points among whites (43% for Obama, 41% for Kerry), he improved significantly among racial and ethnic minorities, gaining 14 points among Hispanics (67% vs. 53%) and 7 points among blacks (95% vs. 88%). Obama’s gains among young people, high-income voters and racial and ethnic minorities suggest that age, income and race were important factors in the outcome of the election. What about religion? How closely was it linked with voters’ choices in 2008? Through statistical analysis of exit poll data, it is possible to see how well one could predict a person’s vote by knowing how often that person goes to church or other worship services. This kind of logistic regression analysis confirms that church attendance was a very strong predictor of how people voted in 2008, even after taking into account other demographic factors, such as race, age, gender, education, income, urban/rural status, region and union membership. Holding these other factors constant, the probability that a voter who attends religious services at least weekly cast his ballot for Obama was 37 out of 100 (.37). By contrast, the predicted probability of voting for Obama among those who attend religious services yearly or never was 64 out of 100 (.64), or 27 points greater than among weekly worship attenders. Race was an even better predictor of voting behavior: the difference between blacks and whites in the predicted probability of voting for Obama was 45 points. But none of the other factors considered in this analytical model – age, gender, education, income, urban/rural status, region and union membership – was as powerful a predictor of voting behavior as worship attendance. Moreover, frequency of worship attendance remained roughly as strong a factor in 2008 as it was in other recent presidential elections. 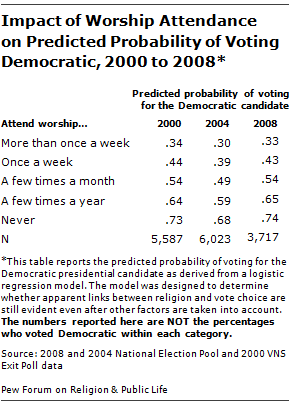 In 2008, for instance, the predicted probability of voting Democratic among voters who never go to church or other worship services was 41 points higher than among those who said they attend worship services more than once a week (even after controlling for other demographic variables). In 2004, this difference was 38 points, and in 2000 it was 39 points. Another way to examine religious voting patterns is to look at coalitions: Which groups delivered the largest portions of a candidate’s total vote? In 2008, Obama’s coalition, viewed in religious terms, differed markedly from McCain’s. Black Protestants, for instance, comprised 8% of the total electorate and 15% of Obama voters. In contrast, black Protestants made up just 1% of McCain’s coalition. Unaffiliated voters, who made up 11% of the electorate in 2008, were a much more important part of Obama’s coalition (16%) than of McCain’s (6%). McCain’s coalition drew disproportionately from white evangelical Protestants, especially those who attend church at least once a week. Observant white evangelicals made up 13% of the 2008 electorate, but they represented almost a quarter of McCain’s voters (23%), compared with just one-in-twenty Obama voters (5%). Less-observant white evangelicals made up 8% of all voters, accounting for 11% of McCain’s voters and 5% of Obama’s coalition. Observant white Catholics also made up 8% of the electorate, and they played a somewhat larger role in McCain’s coalition (10%) than in Obama’s (6%). Less-observant white Catholics, by contrast, made up similar portions of Obama’s and McCain’s voters (10% and 11%, respectively). 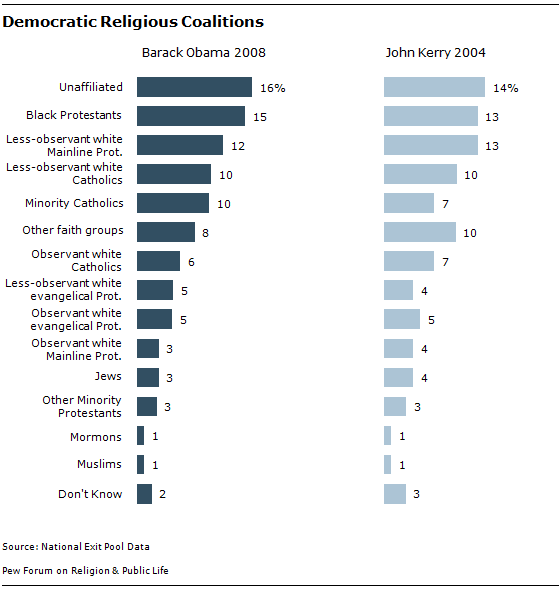 Comparing the 2008 and 2004 Democratic voting coalitions reveals little change in the sources of support for Obama and Kerry, though Obama received a slightly higher percentage of his ballots from minority Catholics (10%, compared with 8% for Kerry). All together, racial and ethnic minority religious groups (including black Protestants, other minority Protestants and minority Catholics) made up a total of 28% of Obama’s coalition, compared with 23% of John Kerry’s. 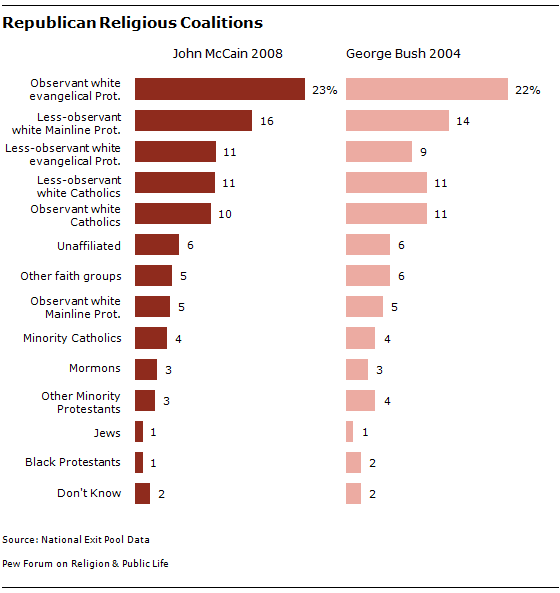 McCain’s 2008 religious coalition was very similar to Bush’s in 2004, with both candidates receiving roughly the same percentage of their votes from white evangelical Protestants, white Catholics, white mainline Protestants and the religiously unaffiliated. Since religion items were not included on all versions of the national and state exit poll questionnaires, a comprehensive analysis of religious voting patterns by region and state is not possible. Despite these limitations, the exit polls do make clear that Obama received less support from white Protestants in the South compared with other regions of the country. For example, 50% of white mainline Protestants outside the South voted for Obama, compared with 32% of Southern white mainline Protestants. And 30% of white evangelicals outside the South voted for Obama, compared with 21% of Southern white evangelicals. Obama’s support was 9 points higher than support for Kerry among non-Southern evangelicals, but Obama did not improve on Kerry’s performance among evangelicals in the South. One apparent exception is North Carolina, an important state that shifted from red to blue in 2008; in North Carolina, Obama’s support from white born-again and evangelical Christians was 9 points higher compared with support for Kerry in 2004. Responses to the religious affiliation question were first combined to form a single category for those describing their faith as “1 – Protestant” or “4 – Other Christian.” Throughout this analysis, we refer to this group simply as “Protestant.” We refer to those who describe their religion as “None” as unaffiliated. The Protestant category was then subdivided into three smaller categories – white Protestants, black Protestants and other minority Protestants (including Hispanics, Asians, American Indians and those of other races, but excluding blacks) – based on responses to the race and ethnicity questions. Catholics were also subdivided into two smaller categories – white Catholics and minority Catholics (including blacks, Hispanics, Asians, American Indians and those of other races). White Protestants were divided into two groups based on responses to the born-again question. Those answering the question affirmatively are referred to here as white evangelical Protestants, while those answering negatively or refusing to answer the question are called white mainline Protestants. 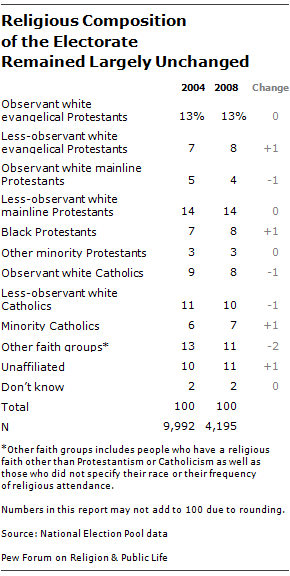 Finally, white evangelical Protestants, white mainline Protestants, and white Catholics are each subdivided based on responses to the religious attendance question. Those saying they attend religious services once a week or more than once a week are referred to as “observant” members of their respective groups, while those saying they attend services less often are referred to as “less observant” members of their groups. Further methodological details about how the exit polls were conducted are available through The Roper Center Public Opinion Archives. This analysis was written by John C. Green, senior research adviser to the Pew Forum and professor of political science at the University of Akron, and Scott Clement, survey research analyst at the Pew Forum.